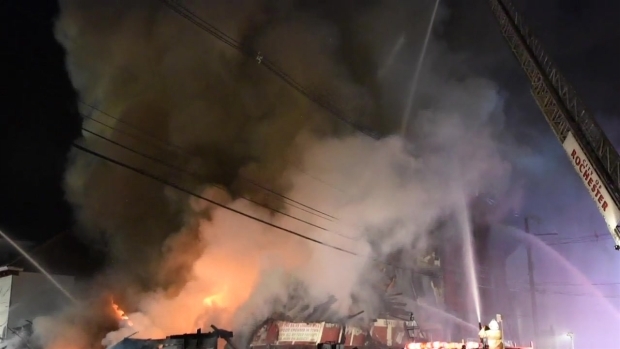 Fire officials believe the fire started at the State Street Saloon around 12:30 a.m. before moving quickly to two separate buildings. The properties are located near Market Square, the heart of the city's downtown area, with numerous shops, restaurants and historic buildings. One firefighter suffered a shoulder injury battling the blaze. All of the residents in the affected buildings escaped unharmed, though some had to be rescued by firefighters with ladders. "I opened my window up, I said, 'Hey guys, I can't get out. I can't go down the stairs. It's just too much smoke,'" resident Craig Langton said. "They put a ladder up and laddered me down." In all, 17 residents were displaced by the fire. Forty-four communities and more than 100 firefighters helped extinguish the fire. Portsmouth Fire Chief Steve Achilles said it was the largest fire he's seen in almost 20 years as a firefighter. 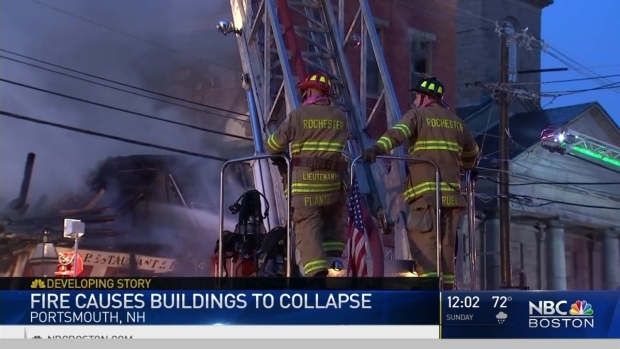 On Monday afternoon, some 18 hours after the fire started, crews were still working to put out hotspots as residents gathered to see the one-time Portsmouth institution, now reduced to a pile of rubble. "This is terrible," said John Cheney, as he took in the scene. "It was a nice little place in downtown Portsmouth." Officials said the fire broke out in the kitchen, and while the exact cause is still under investigation, they don't believe it is suspicious. State Street Saloon has been a fixture in Portsmouth for 35 years, and its owner said he hopes to rebuild. "It's gonna be a loss for us - for my patrons as well as my employees," owner Eli Sokorelis said.